On 4 June 1913, Emily Wilding Davison stepped on to the Epsom Racecourse to stop the Derby. A heroic, yet fatal, this action was the single most important protest in a mass, and militant, campaign by the Suffragettes. Her cause, Votes for Women. A demand that would finally be met five years later in 1918. 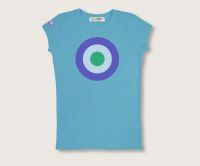 We mark the anniversary of Emily's action with a set of shirts using the original colours of the Suffragette movement, purple, green and white, in a modern roundel design. Unisex sizes large (44inch chest/110cms) XL (48inch/120cms) XXL (52inch/130cms).